El Mundo Deportivo claims that Manchester United is planning a surprising double swoop on Real Madrid with a £55 million bid for Mesut Özil and Kaka. Meanwhile reports in England claim that Everton rejected a £28 million offer from Manchester United for Marouane Fellaini and Leighton Baines. 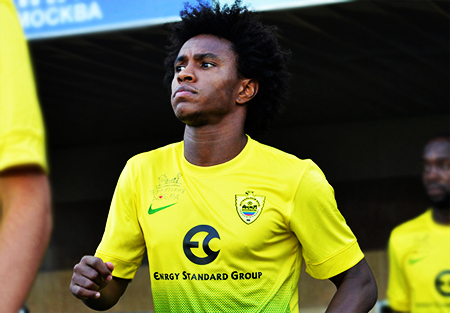 that Tottenham is going to upgrade their bid to Anzhi Makhachkala for Willian, following Liverpools £26 million bid earlier this week. The mirror reveals that Tottenham is going to upgrade their bid to Anzhi Makhachkala for Willian, following Liverpools £26 million bid earlier this week. The Independent reports that Arsenal has given up on the attempts to sign Wayne Rooney, and is now concentrating on Michu, Swansea’s Spanish striker, who’s estimated at around £25 million. The Sunday People claims that Chelsea is going to make another offer for Wayne Rooney: £40 million, with a weekly salary of £300,000 for England national team’s striker. José Mourinho commented on the subject: “We will try to sign another player until the last day of the transfer window. A striker. However, I’m not going to name names, they are all players that belong to other clubs”. Arda Turan’s agent reveals that the player is close to making a transfer to the Premier League, specifically to Chelsea or Liverpool: “We are having negotiations, and the English teams know Atlético’s position about releasing him, but if they pay the price in his release clause Atlético will have no choice but to let him go”. Everton marked James McCarthy, Wigan’s midfielder, as the main candidate to replace Marouane Fellaini, in case the Belgian midfielder transfers to Manchester United. The Sunday Express claims that Chelsea and Arsenal have joined Manchester City in the race for 17 year old Belgian midfielder, Zakaria Bakkali’s signature. The player currently plays for PSV Eindhoven and became the youngest player ever in the Dutch league to score a triple goal. Italy reports that Rudy Garcia is looking for more defenders, and the next name on his book is Steaua Bucure?ti’s defender Vlad Chiriche?. Southampton makes an amazing purchase with Pablo Osvaldo, the Italian national team and Roma’s striker, for a club record price of €15 million. The striker will be earning around £60,000 a week. Milan loaned 19 year old striker, Kingsley Boateng, to Catania for one season.